We run occasional limited time offers and promotions so watch this space! Alternatively why don't you sign up to get our offers, promotions and last minute availability sent straight to your phone! Charged at your standard network rate. You can opt out at any time by replying to any message with the word OUT. Here at The Hair Boutique, we appreciate the loyalty our customers show us by coming back month by month, year on year. We like to give something back, that is why all clients are given a Loyalty Card on their first visit. Points are awarded for each treatment the customer has with us and £10 discount is given each time you reach 20 points. Please ask if you want any further information. 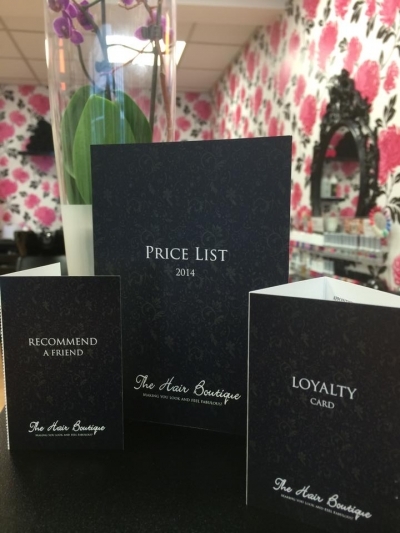 Next time you are in the salon, pick up one of Recommend a Friend Cards. Not only does this give you £5 off your next treatment, you friend benefits too! Thank you Claire , for sorting my hair out, when you first started doing my hair it was a bit of a mess, months later it is amazing, it now feels amazingly soft and the cut is always just right.